See this article to learn how to add or edit a product. You can add up to 10 images for your product. Ideally images should be JPEGs and around 1000 pixels width. In the Store section, click on the products link on left hand side. On this page, you would see the listing of all the products. Click on any product now. On the product edit page, scroll down to the Images section. 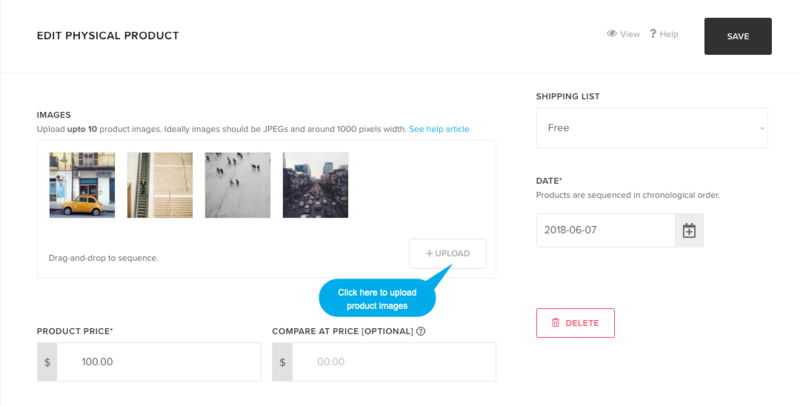 Click on the Upload button to select images from your computer and add them to the product. As you select the images, The upload will start automatically. You can upload multiple images in one go. Save your changes by clicking on save button. That’s it. After you have uploaded the images by saving the product, you can drag-and-drop images to sequence them. The first image in the sequence is taken as the default image for the product.